I was just as surprised as all of you were when I heard the news that Sony is discontinuing their CCD line of sensors. I have always been a big fan of their CCDs since the first time I saw the ICX205 sensor in 2003. And with the recent introduction of their EXview HAD II technology, I was even more excited and convinced that they were pioneering CCD technology to new levels. As a result of this news, I am seeing a lot more questions on Sony’s CMOS product line and how it can be used to replace some of the Sony CCD sensors that are already in use today. One of the predominating questions that does come up is “What is Sony’s Exmor Technology?” This article will go through the evolution of this technology and explain some of the benefits of it. It will help your decision on how to transition your current CCD design to use a Sony Exmor CMOS sensor. 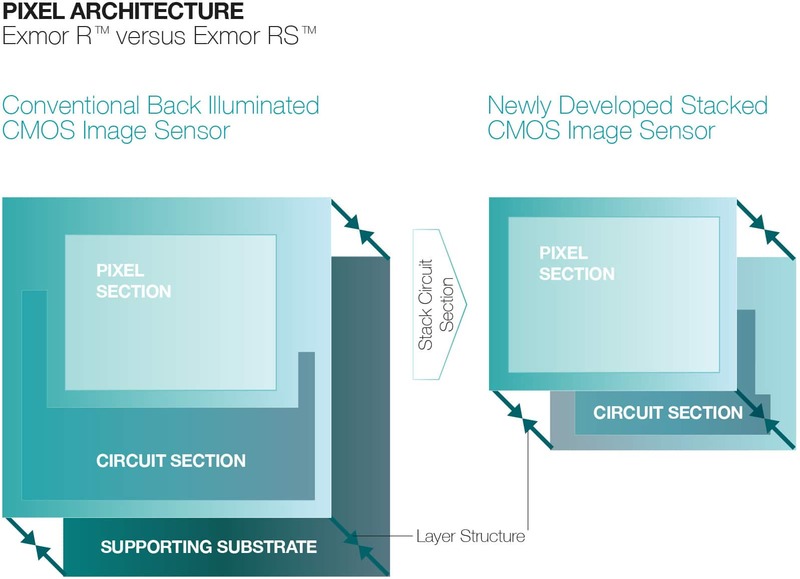 The first generation Exmor technology brought about a revolution in CMOS pixel architecture. Conventional CMOS architecture was very noisy. The way these sensors carried the analog pixel data throughout the chip prior to being digitized allowed them to accumulate a lot of spurious noise. Sony’s engineers looked at this design and utilized some of their CCD experience to find ways to minimize it. This was the dawn of the Exmor technology family. By digitizing the pixel data early on in the transfer process, as seen in figure 1, they were able to minimize the amount of additional noise that is accumulated as the image data travels around within the sensor. With the data digitized, they are free to move them around the sensor at very high speeds without a fear of introducing more noise. 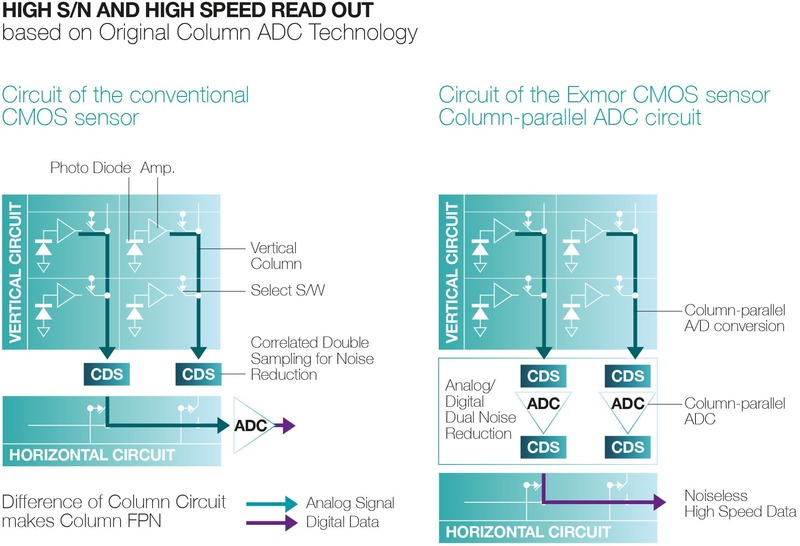 To further improve the noise response of the sensor, they use correlated double sampling (CDS) on either side of the ADC (analog to digital conversion) to cancel out the noise in the signals ensure the accuracy of the digitized data. 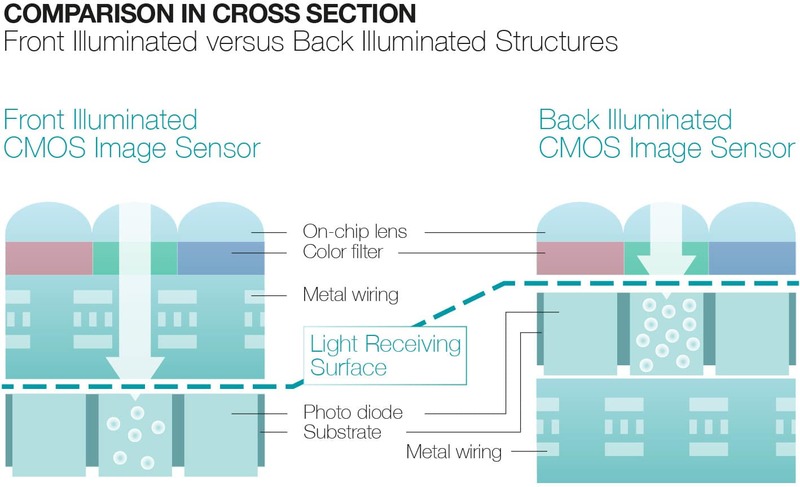 The sensor silicon is designed as a front side illuminated (FSI) sensor which uses aluminum tracks that cross the pixel architecture to carry the data and signals around the sensor. The metal wiring and transistors were placed on top of the photo sensitive silicon substrate where the pixel wells are located and absorb the photons to then convert them to electrons. This was how CMOS sensors were built at the time. This was one area that is going to change with the Exmor technology evolution. 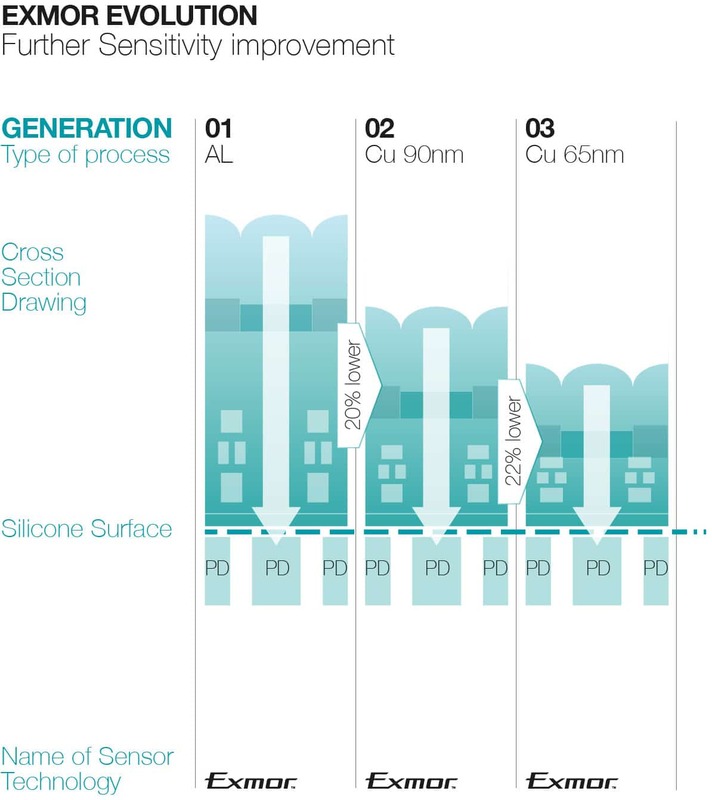 In the second and third generations of the Exmor technology, Sony focused on reducing the depth of the metal wiring and transistor structures that are on the surface of the silicon substrate that forms the individual light sensitive pixel wells. The first big step was to change from the aluminum metal wiring to use a thinner copper wiring. This reduced the depth from the backside of the microlens to the surface of the silicon substrate by 40%. The next big step reduced the thickness of the copper wiring and transistors even further resulting in another 22% reduction in depth, seen in figure 2. This reduction in the metal wiring and transistor structure region was beneficial as it greatly improved the light sensitivity of the sensors using these technologies over their predecessors. In the past, photons that would come in at sharper angles or at shorter wavelengths (blue-green spectrum) would be either reflected off of the metal wiring or dissipated in the transistor region and thus would not be detected and measured in the silicon substrate. Reducing this depth increases the chances of photons reaching the pixel wells and being detected correctly by the sensor making them more sensitive to all visible light, especially in the blue and green spectrums allowing them to work with a larger selection of optics. CMOS sensors were already known to be very efficient in the Near IR (NIR) range when compared to CCDs however their sensitivity was limited due to small pixel wells and noisy sensor designs. With the first generations of Exmor technology addressing the pixel/sensor noise issue, it only seemed natural that the fourth generation Exmor technology addresses the NIR sensitivity by introducing deeper pixel wells to help capture these longer wavelengths. Not only do deeper pixel wells provide a higher dynamic range of pixel values that can be achieved, i.e. could capture and hold more electron data before saturating, it also increased the chances of detecting longer wavelength photons in the deep red to NIR range. Sensors in this generation benefit from higher quantum efficiency (QE) curves in the NIR range between 800-1200 nm wavelengths and their pixel values get digitized with higher bit depths. Both these improvements came as a result of having deeper pixel wells. The introduction of the Exmor R technology decided marked the start of when CMOS technology truly competes with CCDs in almost any vision application. The major technology advance that brought about this change is moving from FSI to BSI (back side illuminated) pixels. Sony’s engineers essentially flipped the sensor silicon design on its head, literally. The sensor’s microlenses and CFA (Color Filter Array) are now on the top surface of the silicon substrate, the photo sensitive area of the sensor, while the non-sensitive electronics, like the transistors and metal wiring are on the back side of the silicon substrate as seen in figure 3. 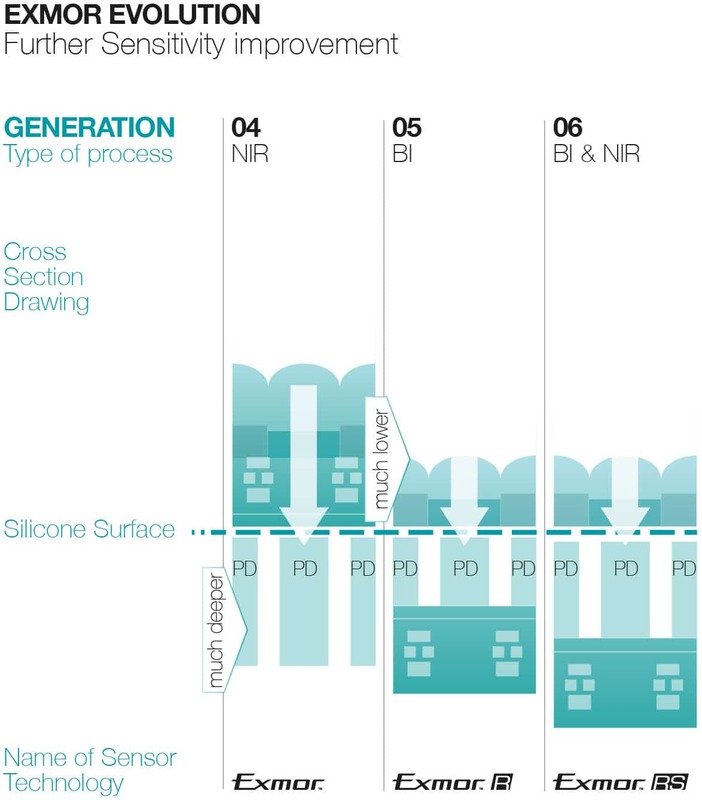 This new design dramatically improves the responsivity and sensitivity of these sensors. Two main reasons how this change in design improves the performance of the sensors are as follows. As I mentioned earlier, shorter wavelengths can be missed if they are not able to reach the pixel’s well and create an electron. With the non-photon sensitive parts are out of the way, the pixels are able to see all this light that was once lost or reflected out of the sensor making them more sensitive in lower light conditions, shown in figure 4. Secondly, light that may have hit the sensor at sharp angles now hit the sensitive area of the sensor where, in the past, it may have directed off to another area of the sensor. This is really important for color sensors as it minimizes the changes of having cross talk in the color data where, for example red light would get directed to a nearby green or blue pixel. As a result, the color fidelity of these sensors is much truer without the need to do extensive post processing to correct the color response in the captured images. When Sony created their first sensors with the Exmor R technology, they based it on the third generation’s pixel well depth. Though these sensors showed a dramatic improvement in sensitivity and responsiveness in the visible spectrum, they did not have the same performance in the NIR spectrum as was previously seen with other Exmor fourth generation based sensors. The Exmor RS technology addresses this limitation by increasing the well depth of all the pixels while still keeping all the other important feature improvements that were introduced with the Exmor R design, as seen in figure 4. Another change that was made with this generation was that the supporting circuit structure for each pixel is now stacked below the silicon substrate instead of beside it. This makes the fill factor of the pixels much higher, around~80-100%, allowing for even more sensitivity and response with a smaller pixel pitch. Typical CMOS sensors are between 20-50% fill factors and rely on the microlenses to increase the pixel’s sensitivity. This sensor technology uses a stacked pixel architecture, as shown in figure 5, allowing for larger resolution sensors to be built into smaller packages. This means that these sensors can take advantage of much smaller, less complicated optics, making them less expensive to build into devices, like what is being used in modern mobile devices. With the latest generation Exmor technologies, a camera or vision system designer can now use less expensive CMOS sensors in their projects that are easier to integrate when compared to CCD based applications. The sensitivity and responsivity rival many CCDs now and the ease of integration make it ideal for engineers who may be new to designing vision systems. The lower costs achievable with these designs will greatly help a seasoned designer meet their lower bill of material cost targets on any existing or new application. There is no need to sacrifice performance for costs anymore with the latest Exmor R and RS based sensors.